My got to recipe file! 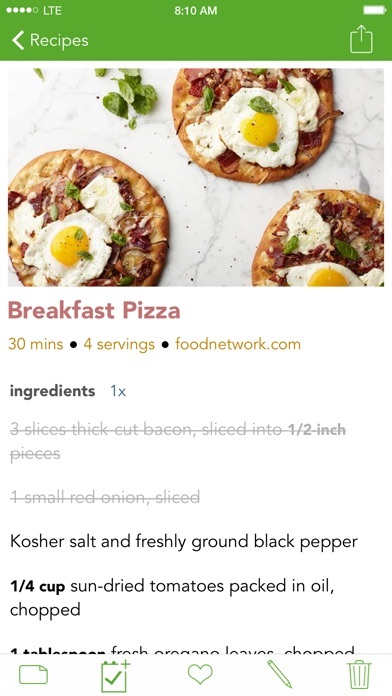 This once fabulous recipe app has been abandoned by its author. He left it with export broken, so I will lose years of recipes and photos. Unfortunately, you must avoid this app. Once a great app, but now buggy no longer updated. I reached out to the dev for help on exporting my hundreds of recipes into a useable file, but never heard back. App clearly abandoned. Developer active on Twitter, is now actively ignoring users. SAD! The economics of the App Store were completely different when Basil first came out. At the time, it was possible to make a living charging money for an app. Those days are gone. Unfortunately Basil seems to be a victim of that change. There hasn’t been an update in two years, exporting to Dropbox is broken, the author no longer responds to support emails, and the website is gone. I’ve changed my review to one star to warn potential buyers that this once useful and enjoyable program is no longer viable. My original review from 2016: I’ve been using Basil since it first came out. It’s great at getting recipes from cooking sites and at entering them manually. And it’s super-useful while cooking. Now that it syncs to the iPhone, it’s even better! I love this app. The parts that work correctly enhance my cooking sessions. I put all of my recipes here so they are available each time I cook. Since getting this app, I never cook without my iPad! I would recommend this app to many of my friends and peers, except there are fundamental flaws (ex: when you press the button to make a shopping list, the app crashes- every time!). I have contacted the developer who replied he was going to release an update in a few weeks. But my request is now many months old and there has not been an update in over two years. It’s too bad there is no support as this app really extends the iPad for me. I only wish I could recommend it to others. 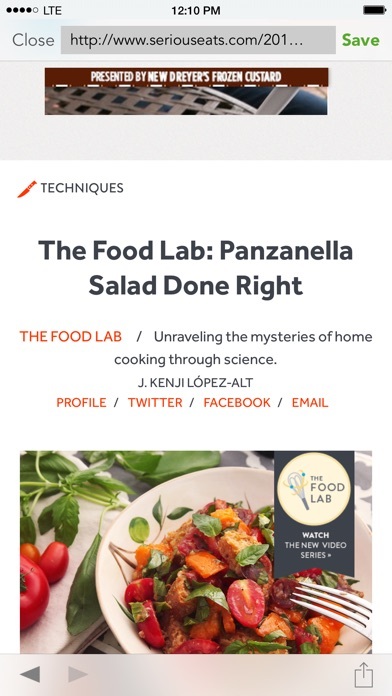 I love this app… I just wish it would zoom in on pictures… For instance, when I take a picture of a recipe card it stays small… I wish I could use it like a picture and zoom it out to be able to see it better. Let's me save right from the browser and makes note of URL and pictures of what I'm cooking is supposed to look like ;) so very worth it. Have been using this for years now and never needed to look for another app to fill in any gaps. Keep up the good work! I really liked this app (great interface...easy to use while cooking and for creating recipes and grocery lists) but after using for awhile, it became very buggy...to the point that it stopped loading entirely and I lost all my recipes. Now I am using Paprika and prefer it. Sad to say, but after persevering for months we are saying farewell to this app. A great concept, but a near constant inability to deliver on core functions (auto-saving your chosen recipes from a wide variety of web sites) just kills it. Customer service response is quick & courteous but that doesn't overcome bad execution of the concept. And even less the money spent for the app. Love this app. 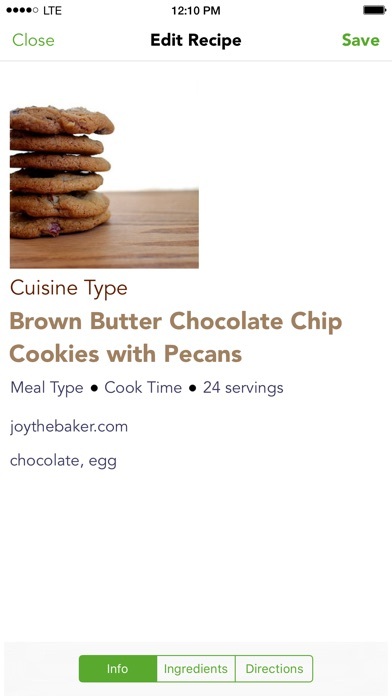 Like that you can download recipes from online sites. I really love adding my own recipes. I only wish that I could upload pictures for my recipes. Can you add that feature? 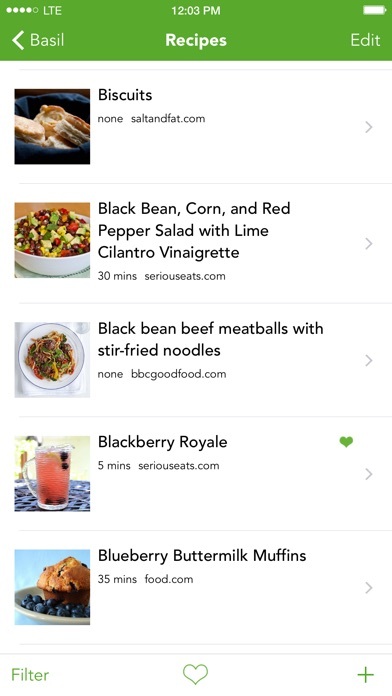 The App is great for organizing recipes. Supports a lot of the common recipe web sites. Cons: - No ability to print recipes (so you can share them with your Mom who doesn't have the Internet or just put them in an old fashioned notebook). Only way to print is to email the recipes to yourself and then print them from your Mail App. - Export options limited to Email, but omit most of the metadata like pictures, etc. - No updates for a year. Is this App abandoned? I love this app. It organizes all of the recipes I add, and makes a grocery list for you (even categorizes by isle). However, lately it's been freezing upon opening. I've had to delete and re download several times! The most recent time I lost a few recipes because I couldn't save them to my Dropbox before it froze. Please send out an update that fixes this!! When I click to save a recipe, I get a blank screen. Nothing is saved. If I could get a refund, I would. I really enjoy the UI of this app (aesthetics matter), but I would really like support for the Apple Watch, since it makes shopping so much easier when I can tick off items on the watch. (Desktop application would also be welcome). Great, but needs printing option and better sharing. Great interface, but when I want to share there is no way to print, and sharing simply sends the original URL. Crashing after opening in iOS 9 on my iPad. Please fix. Love this app normally but can't get any recipes now. The app does not work. It supports barely any recipe websites and the ones that it does support do not always work. If the website is unsupported the app forces you to manually highlight parts of the page. Since the app does not block ads or other unnecessary elements you either include random ads or other irreverent information. The highlighting itself is incredibly frustrating as iOS's implementation is broken. The app uses no iOS extension features. It not only doesn't use standard iOS design language but forces you to install a bookmark in Safari. It's 2016, we have had the iOS sharesheet for 2 years now. This app is terrible, crashy, fails to sync, and is a overall total disappointment. ***EDIT*** Please let me have the Recipes view as default when launching the app. I never use the Groceries section and it's annoying to have to tap once to get into Recipes when that's what the app is even for.... ********** Yes. Thank you for making this a universal app. I have always preferred the iPad app of Basil better than Paprika, but needed the convenience of their iPhone app with sync. Now I'm all yours. ... Heh. Uhm. Am I dreaming? .... I'll leave you alone forever now. Opened the app expecting to see several recipes to help around the kitchen, but no, there were only four recipes. There's no option to search for other recipes. I have had this app for a couple fo years now and enjoy it. Customer service is polite and quick to respond. For supported websites, recipes are easy to save. For those that aren't supported it is a little tricker, but, they make it clear up front which ones they support so I know what I'm in for if I tray from a standard site. The main area of improvement would be to integrate with a wider range of site and to make entering your own recipes a little easier. However, the cost for this app is reasonable and I find it to be a simple way to save recipes without a lot of hassle or needing special accounts. It isn't a memory hog on my ipad either and I appreciate that it doesn't push ads to me. I will say that I don't use it's features for grocery shopping. I like to be a bit old school on that - pen and paper make me happy. I like the app and I'm sorry to see that others have been unhappy. The UX feels off and the Safari Extension rarely works and doesn't allow you to edit entries. Received glowing reviews online but this real-life user is skeptical. Used to be a great app. They decided to copy iTunes 12 and do pictures only for all your recipes. And Apple doesn't allow you to reinstall old versions. Great concept. In writing, it sounds brilliant and convenient. In practice, however, it is filled to the brim with bugs and glitches. Very disappointing. The app does not play well in the iOS system. It does not respect some very important paradigms and has some very ugly looking animations. Love how easy this makes it so save and modify recipes from any website. Just wish there was an iPhone version with iCloud sync so I could take the grocery list with me to the store. On my iPad Air with iOS 9, Basil crashes soon after opening. (I haven't tried it on the iPhone yet.) Please fix!!! The maker personally responded to my syncing questions within a matter of minutes with a step by step response, then again when I did it in the wrong order. He haloed me get everything back that I had put into the app and was convinced it was completely erased. Extremely pleased with the amount of care put into this. Thumbs up to you, Kyle Baxter. With iOS 9. Continually crashes on iPad Air 2 and iPad 2. I can't see my recipes! This is my go to recipe app. It's easy, functional and simple. I have 441 recipes (and counting) on this app and I use it whenever I cook anything. My only complaint about it, really, is that I wish there was more of a 'cloud' basis to it so that I didn't have to worry about losing my recipes by accident should I forget to back it up to dropbox. In general this is a good app. However, since ios9 the app has been crashing a great deal. I found a temporary fix by saving my recipes to dropbox then uninstalling and reinstalling the app but I am unsure how long that fix will last. Selecting from a website has also gotten more difficult (the scroll doesn't work as well and I can no longer tap to select (which is particularly problematic when trying to select photos from a website). So please, fix this to work better with ios 9. Please also add 'FOK - Recipes (Forks Over Knives)' as supported instant save. I'll give it 5 Stars once you've added this feature. I've been using this for about 3 years now, and it's always worked fine for me. It's a nice simple program, can be used offline to access recipes, and doesn't hog phone storage. It lacks some sophistication when populating the grocery list (frozen peas does not go in produce, it goes in frozen foods) but overall I'm satisfied. Also, the one time I had a glitch, the developer responded to me personally, released an update soon after. I just purchased this app. The description was very glowing and the reviews looked good. I went to the "about basil" section for some how to info. I could find nothing. The app is not intuitive at all. At this point I would like my money back. I will find something that actually does what it says. I would have marked this 5 stars but I don't want to have to type out all my instructions and ingredients every time. An option to put multiple pictures/screenshots there would be amazing and truly time saving. Thanks and I hope you consider. The app is awesome and I'm glad to see that it's for both iPhone and iPad the syncing feature is awesome as well. I work in a kitchen and I have to make big batches sometimes for certain desserts. Would be cool to see the amount of servings and recipe multiplier go up. Currently there too low. Maybe have a setting to set the max number for each? Other than that awesome app. It's maddening that with so many apps in all categories that the developers have such a great idea, then fall so short in implementation. Basil seems to be no exception. The many ways to capture a recipe, especially from partner sites which works very well, as well as manual entry is fine. Where the usefulness of the app starts failing is with the grocery list. There seems to be no way to add additional items that do not come from recipes. Contrary to making meal planning, shopping and cooking easier, one now has to deal with either an extra list or the chore of adding these items to a separate list. Also, there is no way to clear the list except to delete each item one by one. The timer feature within recipes is also a good idea, but seriously, one little ding that doesn't repeat?? I give it 2 stars for the great idea. Could be 5 if the ideas were usefully implemented. Had a couple glitches after last update that the developer resolved VERY quickly. Works great now. 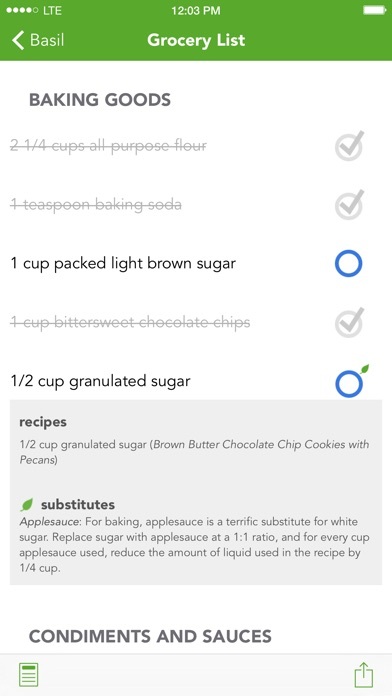 This is a great way to organize web recipes, clean intuitive app. Better than Pinterest ! You know how it is. You've got free apps & paid apps. Some of (both kinds of) them are great & most sit un-used. This is a great great app you won't regret. Enjoy. This app seems like s good idea, but it's terrible to navigate and use. I'd use it if it were a browser plug in, but it doesn't work how you want it to work. I wish you could return crummy apps after you buy them & realize they're useless. Not all of the ingredients carry over to the shopping list and they can't manually be added. Just did a download & sync through Dropbox. Worked perfectly. So nice to have all my recipes at the grocery store. I've been using Basil since it first came out & I love it. Great app. I have been using this app for around two years. Used to love it. Now I just like it. It seems to be buggy lately - errors out and closes - losing whatever you're adding. It has now lost recipes on it's own. Not sure what's going on, but I'm going to start looking at other apps. I do hope the bugs get worked out of Basil, though. I love the app. I can add recipes from anywhere on the web and categorize them as I please. My only complaint is they do not have an iPhone version, which would be very helpful since I don't always carry my iPad when cooking outside my home. For instance 1/2 shows up as 2/2 when doubled. Pepperplate app is a much better option. Really pleased that the recipes are now saving easily, without even navigating from the search, so can continue looking at more recipes. Can delete items off the shopping list too which is really user friendly. Would like to be able to add individual items to my shopping list without having to write a new recipe. Just a meal planner missing and it would be perfect. Really enjoying this app!!! Wish I could get my money back. It doesn't work as advertised. I've used and loved Basil on the iPad for years. Now it's on the iPhone too! Thanks for the update!